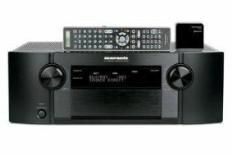 Marantz SR6004 review | What Hi-Fi? There's no denying this Marantz is a flexible slab of electronics. For £799 you'd expect its bullet-proof build and the usual array of audio and video connections, but the SR6004 has a few tricks up its sleeve. In the box you'll also find a RX101 Bluetooth receiver and an iPod cable. Attach the receiver to the M-XPort and you can stream music from any Bluetooth-enabled device, while the cable takes a digital signal from your iPod via the USB slot on the receiver. And it sounds pretty good. Seven channels of 110W apiece are at your disposal, with four HDMI inputs partnered with two HDMI outputs. As well as video and audio switching, the Marantz will upscale video up to 1080p over HDMI. Also present are 7.1-channel analogue inputs. The SR6004 is a very easy listen – and thanks to the calibration mic, easy to set-up, too. Watching Black Hawk Down on Blu-ray, nothing jumps out to impair our enjoyment. The tonal balance is largely even-handed (although the odd treble note is a little sharp), dialogue is firmly presented, and atmospherics sweep around the room with control. But by the same token it doesn't go out its way to involve us in the action. Bullets lack punch, while helicopters sound weedier than they should. This shortage of punch and weight leaves us desperate for a more involving listen. With stereo music, this lack of drive is only heightened with two-channel tunes. This Marantz looks the part, has the specification and some interesting twists, but it lacks a little of the dynamic excitement it'd need to bother the best at this price-point.